Sleep disorders are very common these days! It's estimated that 22 million Americans have sleep apnea, and a large number of cases go undiagnosed. 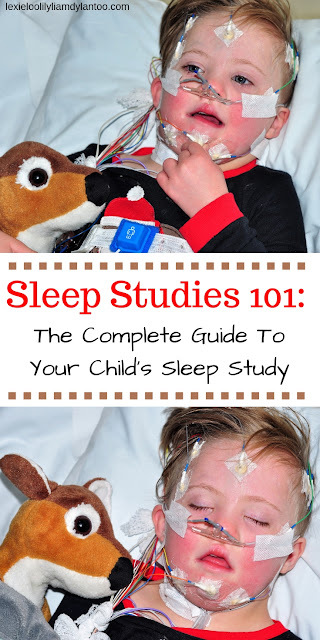 More people are having sleep studies done, and if you have a child who has Down syndrome, it is highly likely that your child will have a sleep study by the age of 4. We went through this process last January, and I remember feeling so nervous about it the day of the procedure. I had NO idea what to expect, other than from the guidelines I was given to prepare for the sleep study, and even a quick search on Google didn't yield much information. I'm not the only person who looks for advice. One of the most frequently asked questions in my Down syndrome groups is about how to prepare for sleep studies! A sleep study is an exam that is done overnight that allows a doctor to monitor a person while they sleep. While the patient sleeps, sleep stages and the cycles of REM and nonREM are monitored throughout the night to identify possible sleep disruptions such as sleep apnea, restless leg syndrome, and other disorders. It is completely non-invasive, but it can be scary or uncomfortable for a child. Sleep apnea is more common in people who have Down syndrome, so it's recommended that children with Ds have a sleep study completed by age 4, even if they don't have any symptoms. Surprisingly, a large number of people who have sleep apnea show no symptoms! Where Do You Go For A Sleep Study? Sleep Studies are done in a sleep lab. Sleep labs are usually located in a hospital or a sleep center. The location will depend on your insurance, the area where you live, or hospital network. In our case, we went to a sleep lab affiliated with our local children's hospital, at a separate location from the hospital. 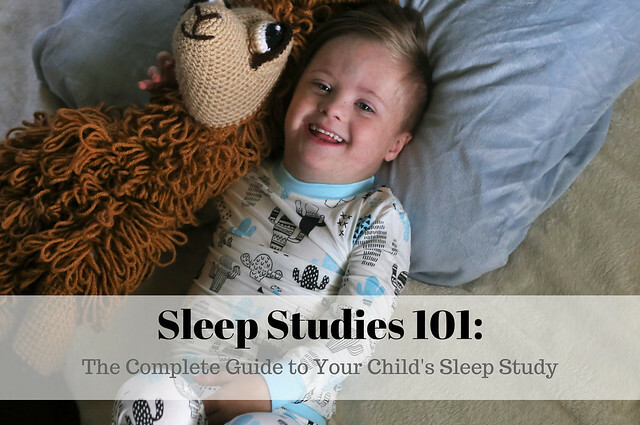 Many sleep labs only allow one parent to stay with the child during the sleep study, so you probably won't have to worry about finding overnight childcare for your other children, but definitely keep that in mind if your spouse works nights or leaves very early for work. I was told to follow our normal routine on the day of the sleep study, which was exactly what we did! Have your child wake up at their normal time. Attend school and activities as planned. Have your child follow their typical nap schedule. Feed your child dinner, bathe them, and dress them in their pajamas before leaving for the sleep lab. One of the things the sleep lab was adamant about was what to wear to the sleep study. When I spoke to them on the phone and when I received an information sheet in the mail, it was specified that children MUST wear two piece pajamas for the sleep study. No onesies, footie pajamas, or sleep sacks were allowed. They also requested that he arrived already dressed in his pajamas. As for yourself, I recommend wearing something very comfortable to the sleep study, and not worrying about changing until you get back home the next day! I heard rumors about the sleep lab being both very cold and very hot, so I decided to be safe, and wear layers. I wore comfortable yoga pants, a t-shirt, a warm sweatshirt, and took along slipper socks and slippers. Although you could dress your child the following morning, you will be leaving the lab really early, so it's easier to just take your child home in their pajamas! I was shocked by how quickly they woke us up, removed the wires, and kicked us out! As I mentioned before, you will not be doing much sleeping, and you will be lucky if you get any sleep at all. Expect FREQUENT interruptions! I was told by other parents to just expect to stay up all night, and that staying comfortable and keeping busy were the most important things! If you're like me, one of your biggest worries will be how to keep your child awake on the drive to the sleep lab! I knew the dim lighting, the full belly, the pajamas, and the car ride would make Liam fall asleep on the 20 minute drive to the sleep lab. Because nobody was able to come with us, it was all up to me to keep him awake on a winter night when dark comes so early! I left the lights on in the back of the car, put on a playlist of his favorite upbeat songs, and kept him engaged by asking him questions and singing with him. Thankfully, it worked! Upon arrival, the sleep technician will check your child in, take you to a room, and do a quick exam to get stats and make sure your child is healthy enough for an accurate sleep study. Then they will leave you alone for a little bit to allow your child to get used to the new environment, decompress, eat a snack, and play. This is when those snacks, drinks, books, and toys will be needed! The most difficult part of the entire process is when the technician comes in to glue on the electrodes and attach the wires. Most kids fight the process, even though it isn't the least bit painful, and it's REALLY hard to watch. The best piece of advice I can give you is to let the sleep technician use the swaddle board on your child. It looks barbaric, but trust me when I say that it makes the entire process run much smoother and faster, and it seems to have a calming effect on the child. After all the electrodes and wires are in place and connected, the lights will be turned off, and the technician will leave the room. He/She may come back in fairly quickly to make some adjustments, but they get right down to business. It might take your child a bit longer than usual to fall asleep, so it definitely helps to have a familiar blanket or pillow, a special lovey, and a white noise machine to cover up any unusual sounds. Once they are asleep, the most difficult part is over, but you are officially in for a long night! The sleep technician will come in very frequently throughout the night to adjust wires and replace any electrodes that fall off. Your child will probably wake up multiple times through the night, and they won't be happy about the wires, which means you will have to soothe them back to sleep. Sleep for you is pretty much a lost cause, unless you manage to sneak in a few power naps. Bring plenty of snacks and drinks to help you through the night, and make sure your are wearing a comfortable outfit. A blanket and pillow definitely helps, even if you aren't sleeping. As for entertainment, iPads, phones, Netlix, laptops and books are great ideas, but because all lights and sounds have to be off, you will need to dim your screens, mute sounds on all electronics, bring a book light, and wear headphones. Yet again, that white noise machine will help cover up any sounds you might make! As for bathroom breaks, no need to worry...there will be a bathroom in the room! Your child might not be used to waking up that early, and won't be very happy about having the glued on electrodes peeled off, but the technician works as quickly and gently as they possibly can. Once all the electrodes are removed, you are free to go! While some people are able to jump back into their normal activities upon being discharged, most I have spoken with are exhausted! Plus, you will have the daunting task of removing the glue from your child's skin and hair! As I mentioned above, I highly recommend clearing your schedule for the day so you both can nap, and arranging childcare for your other children if they aren't in school. You will have to bathe your child shortly after the sleep study, and wash their hair several times. There are lots of home rememdies for removing glue from hair, but most parents agree that washing it a few times, and leaving a deep conditioner on for 5-10 minutes helps. Using nail polish remover on particularly stubborn spots helps, too. No matter what you try, you will probably still be finding a few globes of glue in the hair during the week following the sleep study. Waiting for test results is always frustrating! With a sleep study, there is a lot of data to go through, but you should expect results in 1-2 weeks. What happens next depends on those results. Another sleep study might be needed for more data, your child might be referred to an ENT, removal of the tonsils and adenoids might be discussed, or your child might need a cpap mask. Every child is different, and every experience will be different. For us, the experience was much easier than I anticipated! The most difficult parts were getting Liam to settle down after arriving in the new room, and keeping him still during the application of the electrodes (we eventually used the swaddle board). Liam is a natural explorer, so he had to explore every square inch of the new room before having his snack and playing with a few small toys. Turning the lights on and off, and checking out our bathroom were his favorite things! Just like most kids, Liam hated having the electrodes glued to his head and stuck to his body. It was a struggle for me to hold him down, so the sleep technician recommended the use of the swaddle board. I felt so bad as she swaddled him and strapped him down to the padded board, but it instantly calmed him. Although he still didn't love having things stuck to his head and moved around, he no longer cried or fought, and the process was finished in just a few minutes. Surprisingly, Liam fell asleep much faster than I anticipated. He did try to pull off a few electrodes and wires at first, and the technician had to adjust a few, but I stayed by his side as he fell asleep. After he was asleep, I moved to my bed (a surprisingly comfortable reclining chair to bed combo), and got some work done on my blog, chatted with a few friends, read a few chapters in my book, and watched a movie on Netflix. I didn't get a single moment of sleep, because the interupptions were very frequent. Liam was a bit restless. All of those wires did not look very comfortable, and he kicked and pulled a few off in his sleep. The tech was in our room several times each hour throughout the night to make adjustments and monitor him. 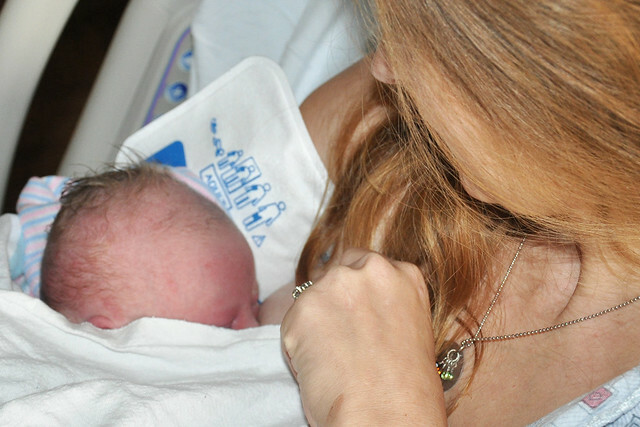 Liam woke up a few times while she was with him, and I had to soothe him back to sleep. Even if I wanted to sleep, I don't think it would have been possible! The tech had enough data by 5 AM, and woke Liam up shortly after to remove the electrodes and send us on our way. Before leaving, she brought in a toy cart, and let Liam pick his favorite toy to take home with him. We were both alert despite the early hour and lack of proper sleep. We came home, and had breakfast before everyone else even woke up. Liam played while I got his siblings ready for school, and after they got on the bus, the two of us fell asleep for the rest of the morning. I gave Liam a bath after he woke up, and washed his hair several times, and allowed a deep conditioner to soak in as he played in the tub. After I rinsed it out, there were a few glue patches left, so I used nail polish remover on those spots, and repeated the process. It got most of the glue patches out, but I was still finding tiny spots of glue for several days after the sleep study. Liam's sleep study was just performed routinely. He wasn't showing any signs of sleep apnea, but we had it done based on the doctor's request. Because he was so active, we put it off for over a year. We did receive the results within the two week timeframe, and Liam did not have sleep apnea. He will not have to repeat the sleep study unless he starts showing signs of sleep apnea as he grows. Although sleep apnea is very common these days, the chances are much higher for a person who has Down syndrome, so it is definitely something that we will monitor! Has your child ever had a sleep study? If so, share your favorite tips in the comments! What a great guide. I'm sure a lot of parents will find this very helpful and informative. I'm glad Liam doesn't have sleep apnea. My dad has it, so he had a sleep study, but he was an adult at the time. Same as my brother.